Image caption There are an estimated 32.4 million gamers in the UK. 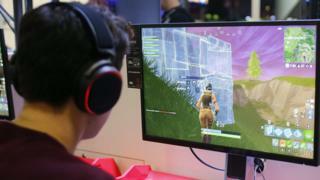 A GP has "prescribed" an 11-year-old boy a two-week ban from computer games such as Fortnite and Minecraft. Dr Amir Khan, from Leeds, said he issued the advice as he was concerned about the impact gaming was having on the boy's life. Dr Khan's tweet came as it was revealed the UK gaming market is now worth a record £5.7bn, while it is estimated there are 32.4 million gamers in the country. He said gaming addiction "can be devastating" and that while Dr Khan's tweet may be "light-hearted", advice to take a break was invaluable. "I've no doubt that it will have a positive effect, even if it just helps him start to discover other activities in his free time," he said. Mr Adair added: "People are gaming at such a young age, and gaming is so effective at fulfilling people in so many ways, that they don't really know what else to do with their time. "By taking a break whether its three days, two weeks or 90 days it gives them an opportunity to create a contrast in their life between life with gaming and life without it. It helps people mitigate against gaming and make it not the only thing they know." However, they say the "evidence base for a direct 'toxic' effect of screen time is contested, and the evidence of harm is often overstated". Dr Max Davie, officer for health improvement for the RCPCH, said: "Computer games are a vibrant and important aspect of young people's culture. "However, given they are a sedentary activity, they must be balanced alongside more active pursuits, and used mindfully, making sure that any snacking is carefully controlled."